“Dies Irae” is a Latin poem on the subject of the Last Judgment. Attributed to a Franciscan monk named Tomaso de Celante (1190 - c. 1255), the complete poem contains 18 rhymed stanzas. (An unknown author later added the “Pie Jesu” couplet and the “Amen.”) Little did this Franciscan know that his colorful poem would provide a springboard for some of the most dramatic musical works ever written. The portion of the complete poem is given below. Dissolve the world into burning coals, Cuncta stricte discussurus! How great trembling there will be, dona eis requiem. * “Sibyl” or “Sybilla” was a title given to the priestess of the Oracle. This setting of Dies Irae isolates a portion of the “Dies Irae” text, and juxtaposes driving, accentuated rhythms with towers of full sonorities. The piano writing provides an agitating “undercurrent” in the opening and closing sections. 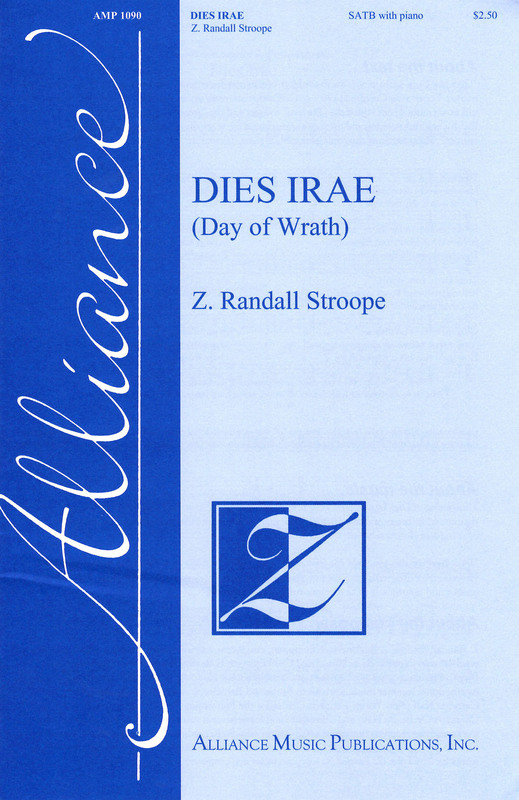 “Dies Irae” is also available for SSA with piano (AMP 0575) and TBB with piano (AMP 0616). However, these transcriptions are not compatible in terms of combined performance. Each “version” is unique and tailor-made to fit the sonorities of that medium. Z. Randall Stroope is an American composer, conductor and university professor. His composition teachers were Normand Lockwood and Cecil Effinger, both students of Nadia Boulanger, the famous French teacher (and student of Gabriel Fauré.) He is the artistic director of international summer music festivals in Rome and Barcelona, as well annually conducting at Carnegie Hall (New York), Kennedy Center for the Performing Arts (Washington, D.C.), Chicago's Orchestra Hall, and other U.S. and international venues. He has 135 published musical works and has received numerous composition awards. Recordings of his music can be heard on his web site Z. Randall Stroope, publisher websites, or definitive recordings he has made of his works for youtube (Z. Randall Stroope, conductor and composer).